Boss Graham Westley relishes pressure from his Peterborough United chairman, who said he would sell if Posh were not promoted in the next 18 months. Darragh MacAnthony, whose side are 11th in League One, tweeted on Saturday after Posh's 4-0 loss to Bradford City. 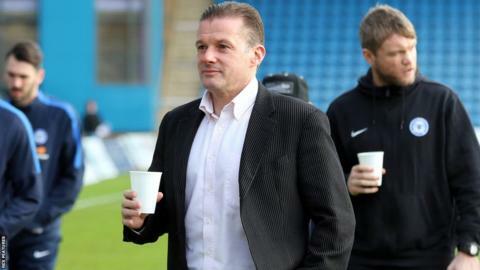 Westley said: "You never win anything unless you put pressure on yourselves. I'm cool with any strategy he's got that heaps the pressure on. "You test yourself when the going is tough and people demand results. He added to BBC Radio Cambridgeshire: "If you can't stand the heat, get out the kitchen. I love this kitchen." MacAnthony has been Posh chairman since 2006 when the club were in League Two, and since then they have earned promotion to the Championship twice, but have been in League One for three seasons. Westley replaced Dave Robertson in September and has guided the club from 18th in the table to six points off the play-offs, as well as the FA Cup fourth round, where they took Premier League side West Brom to a replay and lost in a penalty shootout. "I'm sure (MacAnthony) means his comments as I've never known him to say something he didn't mean," added Westley. "He's very much a man of his word in my experience, but I don't think he intends to sell the club, he intends to win promotion. "Someone was speaking to me earlier in the week about what if he goes, and I said I'd talk the board into keeping him because he's good at what he does."